Bring a small pot of water to a boil. Add the sweet potatoes and return to a boil. Reduce heat to a simmer and cook for 15 minutes until fork-tender. Drain well and transfer to a blender. Meanwhile, bring a large pasta pot of salted water to a boil and cook pasta following package instructions. Drain well, return to saucepan, and set aside. 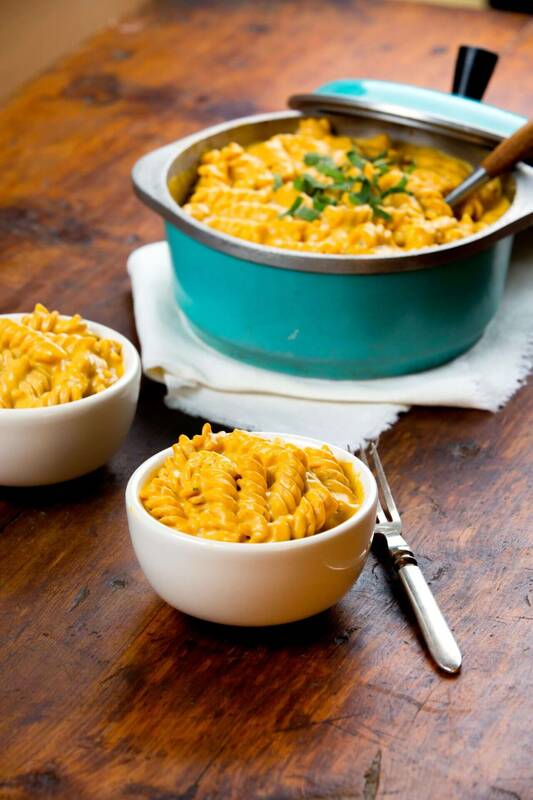 In a medium bowl, whisk together soy milk, nutritional yeast, cornstarch, Dijon mustard, onion powder, 1/2 teaspoon salt, cayenne pepper (if using), and black pepper. In a 2-quart saucepan, melt the butter over medium heat. Add half of the sage (reserve the remaining sliced sage leaves) and all of the garlic; cook just until they are aromatic and begin to brown. Whisk in the soy milk mixture. Reduce heat to medium low and cook until thick. Add the sauce and lemon juice to the sweet potatoes in the blender and blend until thick and smooth. Toss with the cooked pasta, reheat gently if necessary; taste and add salt &pepper if desired. Serve topped with the reserved sliced sage. *The nutritional analysis was done using whole wheat pasta.